Someone asked about 14 bit MIDI on Twitter, then implemented their own solution while I was snoozing – different time zone? Red Bull? Who knows – so I thought I’d upload my own version for comparison. It receives two MIDI controllers, one of which represents the most significant bit, the other of which represents the least significant bit. 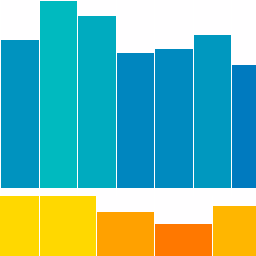 It uses a bit shift module in Core, which is always fun. Whee! The upshot is, you get extremely high resolution for controlling things that you don’t want to be overly steppy, like filter cutoff and sample playback position. I’m not using it any more because Reaktor now has OSC in the plugin version, so I use OSC tools like Konkreet Performer, TouchOSC and Lemur for my hi-res controller needs. 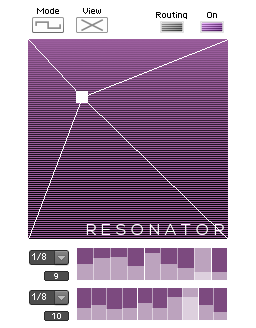 But for those of you who have hardware that supports 14 bit MIDI, this is going to be useful, as Reaktor has no native 14 bit controller support. 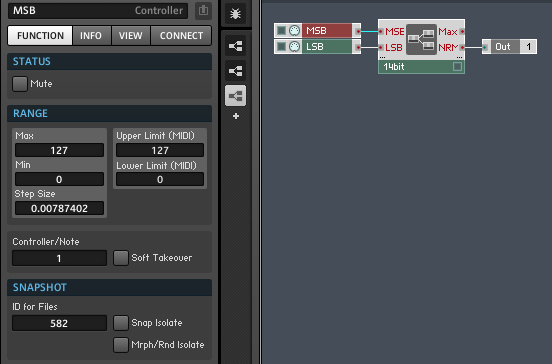 All you have to do is decide which controllers you’re using, set them in the controller properties, then use the NRML output for a normalized 0 to 1 control range. Here’s the macro. Happy controlling! You can either multiply the incoming MSB by 128 or bit-shift it by 7 bits. I had tried both, got the same basic results, and left both modules in the core cell but with only one connected of course. Sorry for the confusion! I’ve uploaded a corrected macro. 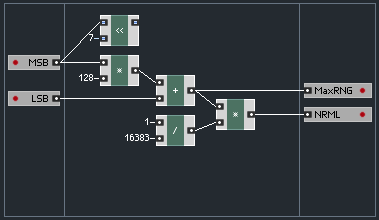 In this one, the value range of the controllers can be left at 0 to 1 which is the default in Reaktor, and the values, math and scaling happen in the core cell where everything’s explicit – I like to avoid having magic numbers hidden in properties whenever possible. 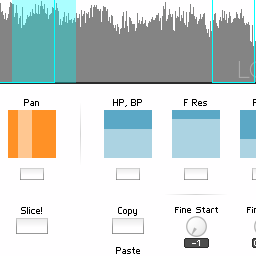 This entry was posted in download and tagged 14 bit MIDI, core cell, HD MIDI, macro, reaktor on May 9, 2013 by peterdines.